The 2019 Heritage Home Show is Coming April 6th & 7th! This year's Heritage Home Show will feature special celebrity guests - Expert carpenter Clint Harp from HGTV’s Fixer Upper and DIY’s Wood Work and Animal Planet’s Pete Nelson from the popular Treehouse Masters show! It also includes Family Fest with inflatables, the Custom Art & Home Décor Pavilion, the K9 Frisbee Crew Trick Dog Show, food and beverages, and much, much more...we hope to see you there! If You're Looking to Do Some Projects Around the House or You Just Need Some Ideas...the Heritage Home Show is the Place to Be! The Heritage Home Show has a little bit of everything for your home: furnishings, landscaping, windows, kitchens, baths, roofing, flooring, lawn equipment...come see what's new this year! Whether you're remodeling or adding on, buying or selling, or even building new... Heritage Federal Credit Union has affordable financing options for a variety of home projects. Visit us at our Home Show Booth or visit Fix Up your Home with Heritage and learn more about our Fix Up Your Home loans that can help turn your dreams into reality! *April is Youth Month, So Bring the Kids! 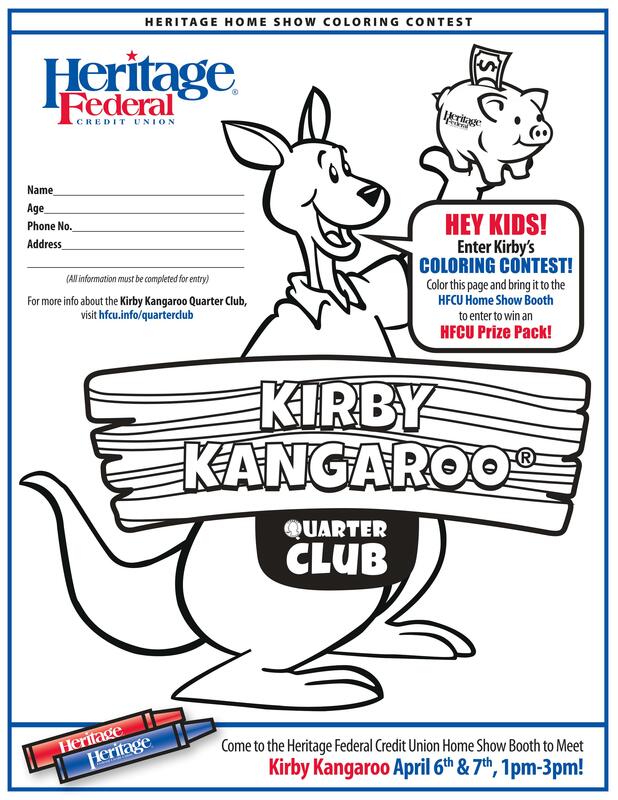 Kirby Kangaroo will also be making an appearance at our Home Show Booth from 1 pm - 3 pm on both days! Need Home Show Tickets? Members Get in FREE! As members, you can get into the Home Show FREE by showing your membership card or your HFCU Debit or Credit Card!